Most prospective parents who have done their research are well aware of the fact that babies love contrasting or bright colors. Primary colors are normally envisioned when we consider these contrasts, but black and white baby designs can be just as useful and advantageous as bright primary colors. The contrast is significant enough to help with brain synapse development, and can provide a unique focal point for a bored or restless baby. 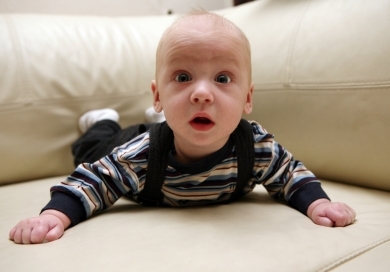 It can also improve curiosity, and help your baby develop an attention span. Black and white baby designs are very simple to use in the nursery, as they are often simple baby-themed ideas, patterns, or shapes in black and white shades. Everything from Disney™ characters (such as this Disney Mickey Mouse Zero Gravity 4 pc Toddler Bedding Set ) to modern patterns and shapes can be used, and most are available at retail stores, Internet shopping hotspots, and even home design or improvement centers in the world. This type of baby design is often one of the easiest to use and find, no matter where you are in the United States. Character designs are simple to do in black and white, and there are dozens of age-appropriate themes that can be used for babies and toddlers. Mickey/Minnie Mouse™ and friends are some of the most common, since the distinctive ears and basic shape is so easy to create and recognize. This theme can be extended well into the childhood years, and adding touches of color is very easy with posters, stuffed characters, or similar decorative accents. Black and white patterns can also be used to create your nursery, such as gingham prints, paisley patterns, and geometric designs. These are stimulating to your baby, and can always be used for toddler themes and well into the childhood years, as they match many different decorative ideas for added versatility. Mixing and matching patterns and shapes is a great way to start introducing shapes and letters to your baby from a very early age. A black and white baby design does not have to imply that the entire nursery is designed in black and white shades. You can easily add touches of color throughout the bedroom to break up the monotony, by using decorative accents, accessories, or wall art to add a splash of color in different places. For example: reds, yellow, pink, blue, or green can easily be included as blinds and shades, door color, fabric shade for lamps or accessories, and rugs. Color accents can be simple or bold, depending on your personal taste, without taking away from the black and white baby design. It is very simple to mix and match black and white patterns with colors in very distinctive ways. For example, you can easily mix vintage characters with modern takes on the same character. Frame inexpensive posters or similar wall art for another color splash idea. Most wall art of this nature is very affordable, and makes decorating much more fun and interesting. When you design the nursery, introducing your baby to things like texture, color, and education should be your first priority. Whether you choose to use alphabet letters, numbers, basic shapes, geometric patterns, or even recognizable characters, there is no more rewarding experience than realizing that your baby is beginning to recognize the specific colors, shapes, or characters that you added as accents or focal points in the nursery. Staff writer for WallDecorandHomeAccents.com, Jessica Ackerman, has extensive design experience using tropical wall decorations and metal wall grille.